(a) Represent any two velocities and by a vector diagram, and illustrate the vectors and . (b) When the sun, S, is above the horizon, an aeroplane glides in for landing with the sun behind, moving with a speed of m.p.h. along a path sloping down from the horizontal, as in the diagram. Find the speed of the plane’s shadow on level ground ( ). Write a short note on linear momentum. A uniform cube of wood of mass lbs. hangs vertically by a long light string fixed in the centre of one face of the cube. 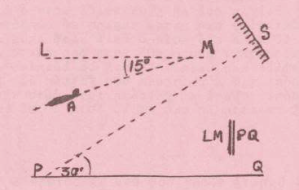 A bullet of mass half an ounce moving horizontally with velocity strikes the centre of another face in a direction perpendicular to the face, embeds itself in the wood and causes the combined mass to swing. If in the first swing the centre of gravity of the combined mass rises inches, calculate the magnitude of . For a body moving in a straight line with constant acceleration , initial velocity and velocity at time , show that and . A cage travels down a vertical mine-shaft yards deep in seconds, starting from rest. For the first quarter of the distance only the velocity undergoes a constant acceleration, and for the last quarter of the distance the velocity undergoes a constant retardation, the acceleration and retardation having equal magnitudes. If the velocity, , is uniform while traversing the central portion of the shaft, find the magnitude of . Deduce that its motion is circular. A particle is moving along the circumference of a circle with constant speed. Show that that components of the motion of the particle along any two perpendicular diameters are Simple Harmonic Motions. A particle is projected horizontally from a height with velocity and falls under gravity. If are the co-ordinates of the particle at any time, and the co-ordinates of the point of projection, show that us the equation of its path, the x-axis being horizontal and the y-axis vertical. A marble rolls off the top of a stairway horizontally and in a direction perpendicular to the edge of each step, with a speed of feet per second. Each step is in. high and in. wide. Which is the first step struck by the marble (assuming the stairway is sufficiently high)? Masses of lb., lbs., lbs., and lbs. are placed at points the co-ordinate of which are , , , and respectively. Locate the centre of gravity (or the centre of mass) of the system. Two discs of radii and are placed flat on a horizontal plane with a distance between their centres. If is their centre of gravity and the centre of gravity of the large disc calculate the length of . A square hole is punched out of a circular disc (radius ), a diagonal of the square being a radius of the circle. Show that the centre of gravity of the remainder of the disc is at a distance from the centre of the circle. Explain “normal reaction” and “angle of friction”. Deduce where is the angle of friction and the angle between the normal reaction and the reaction (resultant reaction). A uniform rod feet long leans against the smooth edge of a table three feet in height with one end of the rod on a rough horizontal floor (as in diagram). 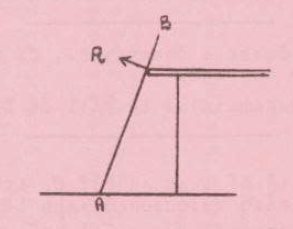 If the rod is one the point of slipping when inclined at an angle of to the horizontal, find the coefficient of friction. A steamer going north-east at knots observes a cruiser which is miles south-east from the steamer and which is travelling in a direction east of north at knots. Illustrate by diagram the cruiser’s course as i appears to the steamer. Find the velocity of the cruiser relative to the steamer, in magnitude and direction, and find also the shortest distance between the two ships. Establish an expression for the pressure at a depth in a liquid of density at rest under gravity. Hence show that the resultant thrust on a plane surface immersed vertically in the liquid is the product of the area of the plane surface and the depth of its centre of gravity. Find the resultant horizontal thrust on a rectangular lockgate feet wide when the water stands at a depth of feet on one side and feet on the other. (1 cu. ft. of water weighs lbs. ).